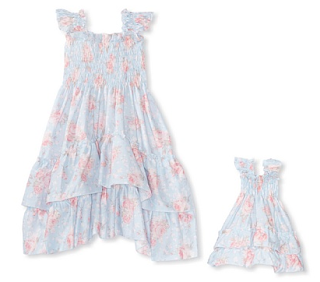 What better way to put a smile on your little girl’s face than with a new dress--and a matching dress for her doll from Me + Dolly by 4EverPrincess. Here, choose from a variety of paired sets in adorable stripes, polka dots and hearts. With breathable 100% cotton and machine washable fabrics, this collection can be worn anytime, anywhere. Playing dress up just got a lot more fun, especially when your lovely lady can do it with her favorite companion. Doll dresses fit most 17 inch dolls.